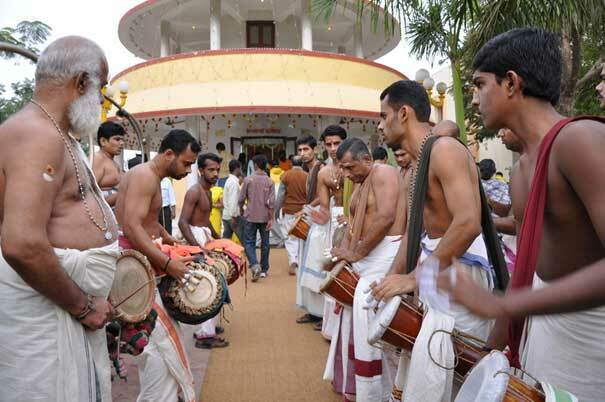 Sri Narayana Jayanthi is festival of the celebrated across the southern state of Kerala, Tamul Nadu and where the community embers are located across the world. 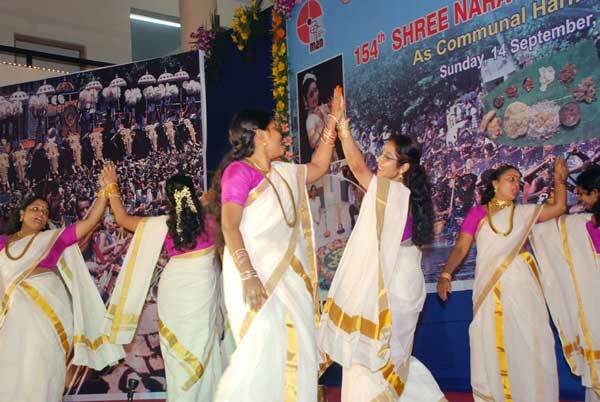 Its also called Chathayam Dinam in kerala. 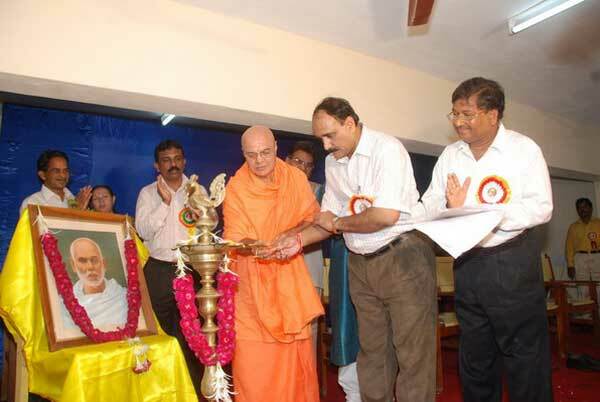 It marks the birthday of Narayana Guru, greatest Social reformer of India. 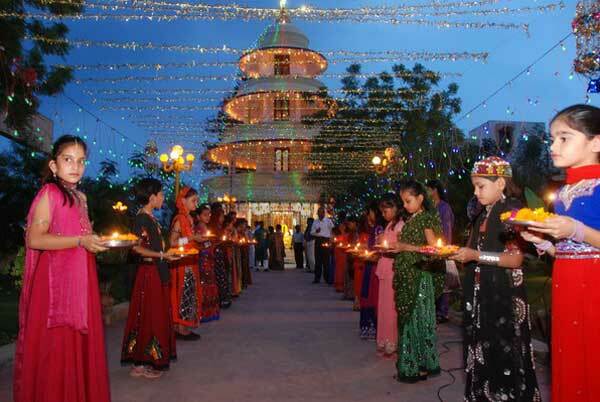 It is celebrated in all over world by the communities. The birthday of this great saint is celebrated on the Chathayam asterism of the Malayalam month of Chingam (Leo). 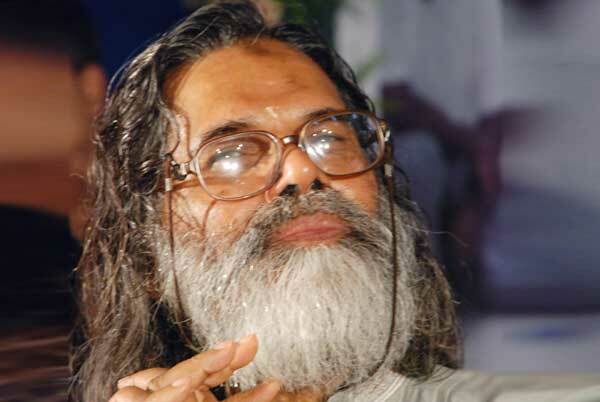 In a society broken into fragments by casteism and economic inequality, he emphasised the gospel of ‘one caste, one religion and one god.’ Even though the Guru accepted the fundamental principles of the Vedic religion, he revolted against caste-based ascendancy, caste discrimination and sectarianism. Communal harmony and community prayers, bhajans (devotional songs), bhagwataparayanam, special pooja, feasts to the devotees. etc. 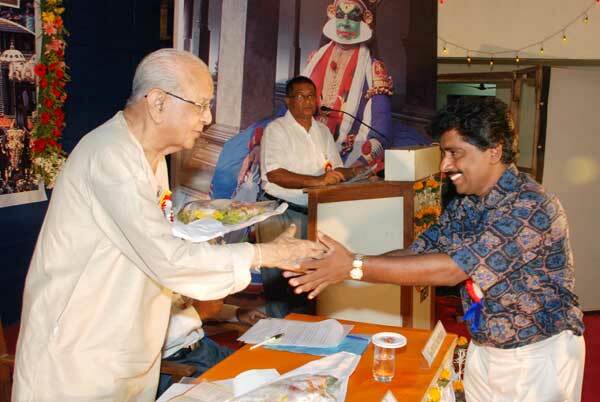 mark Gurujayanthi celebrations. He advised them to organize a series of lectures on the themes with experts conducting them. The lectures should be listened to attentively. More important, the principles should be put into practice. Success must accompany efforts. Only then will the country and the people benefit. 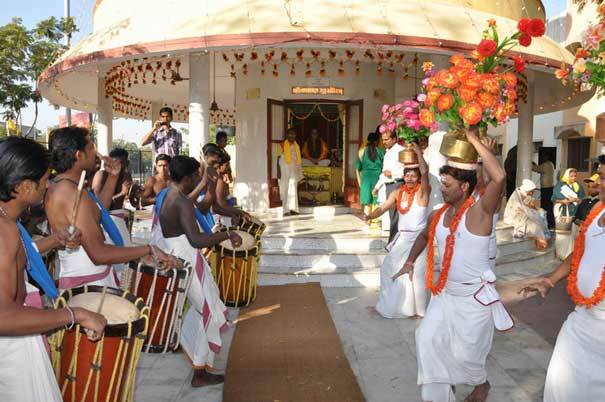 This must be the core purpose of Sivagiri pilgrimage. 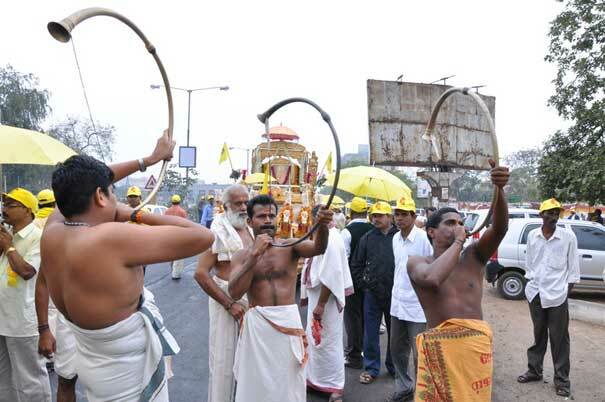 On the basis of this, the Devotees in Ahmedabad have also started Theerthadanam procession wherein Guru’s devotees taken part in all over Gujarat and from outside also. 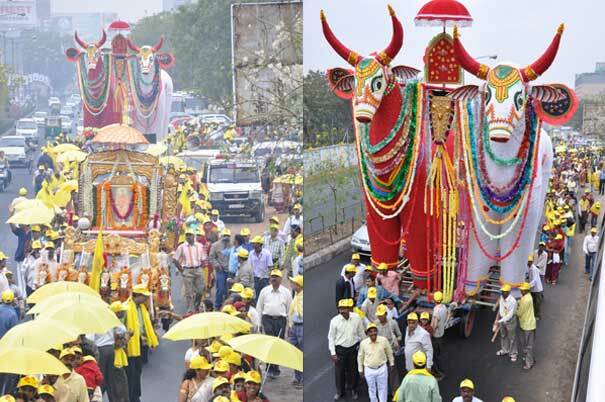 Colourful procession with various tableaus, decorated chariot, vehicles, devotees wearing yellow cloth, chanting of Guru’s slogan, etc. 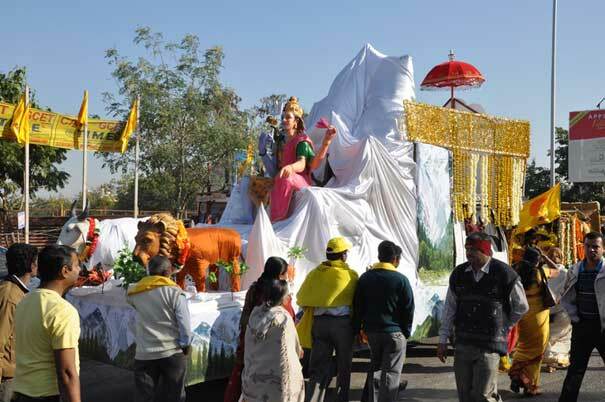 take place in Ahmedabad on the 1st Sunday of January every year. 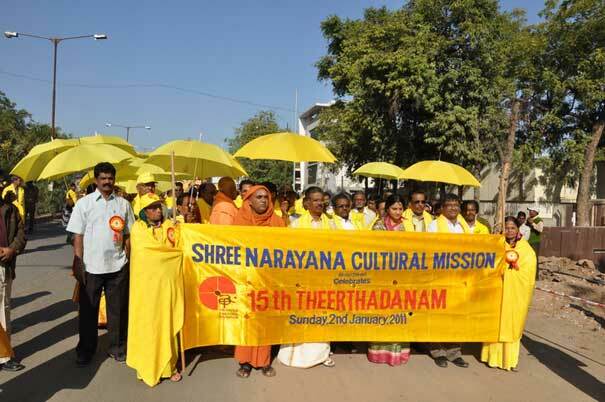 Poojya swamiji’s from Shivagiri and other places take part in the Theerthadanam function and lectures are delivered. Sree Narayana Guru Samadhi marks the death ceremony of the Sree Narayana Guru, saint, prophet and social reformer from Kerala. The great Guru attained Samadhi on September 20, 1928. 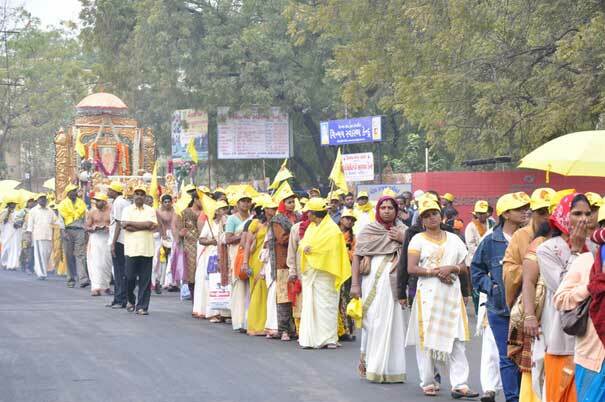 Thus the ceremony is organized to remind the world that spiritually he lives forever in the minds of millions of his followers across the globe, though physically Guru disappeared. 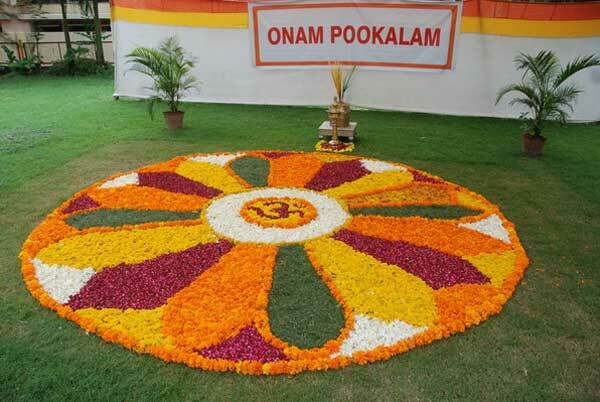 It’s celebrated on the 5th day of Malayalam month kanni. 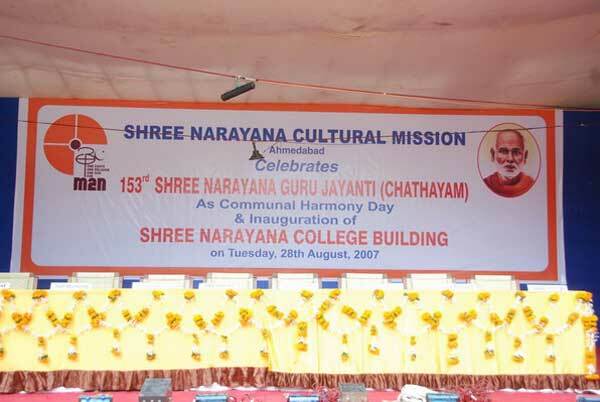 Sree Narayana Guru lies in a state of samadhi at Sivagiri, Kerala. 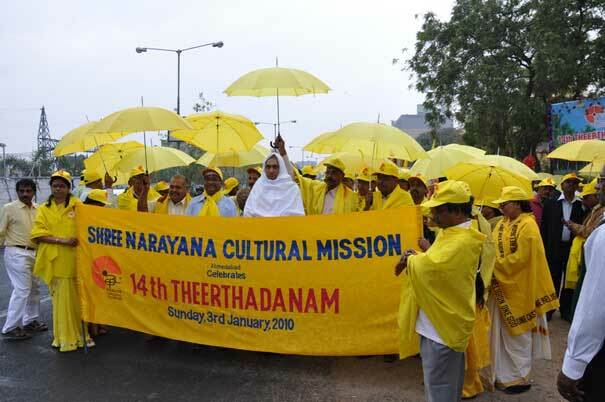 Thousands of pilgrims visit there each year, to pay homage to the man who drastically changed the face of social life in Kerala and is a source of inspiration for all social reformers. 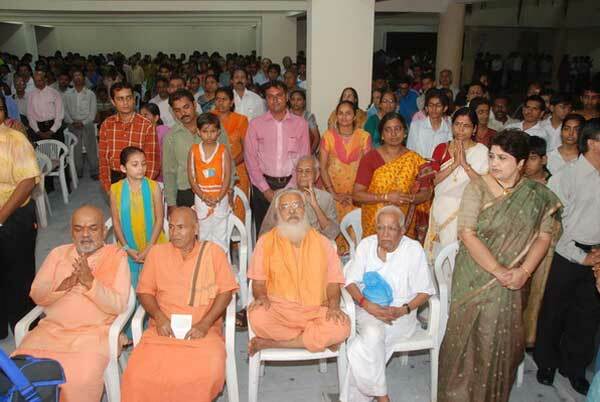 In Ahmedabad, the devotees also observe the Guru Samadhi by offering homage by way of early morning pooja, bhagawataparayanam, deeparadhana, and bhajan, etc. 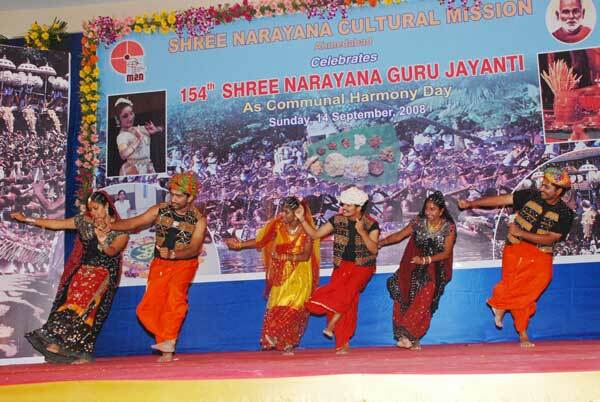 Shree Narayana Cultural Mission, Ahmedabad organizes alliance meets in Ahmedabad every year to facilitate the alliance between the prospective bride grooms of the malayalee community settled in Gujarat for several years. 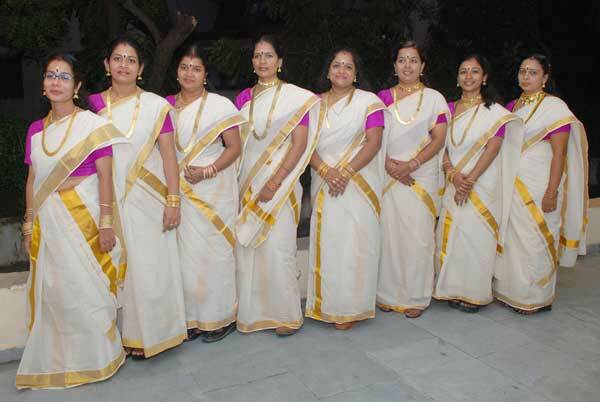 Girls and boys from various Malayalee communities anxiously participated in the meet in search of their prospective bride-groom. The alliance meeting is organized very professionally with meticulously planning each activity. Pre-registration starts one month in advance. Besides pre-registration, we facilitate the participants with spot-registration also. The registration is done at a nominal fee, to promote the participation of the prospective boys and girls. In the morning session, the details of boys and girls are presented through a power point presentation giving the photograph and other details along with the physical presentation of the boys and girls at the stage provided for the purpose. In the post lunch session, we arrange individual meetings between the interested boys and girls who met in large numbers and discuss various pros and cons including way forward for taking the discussion further for a possible marriage alliance. 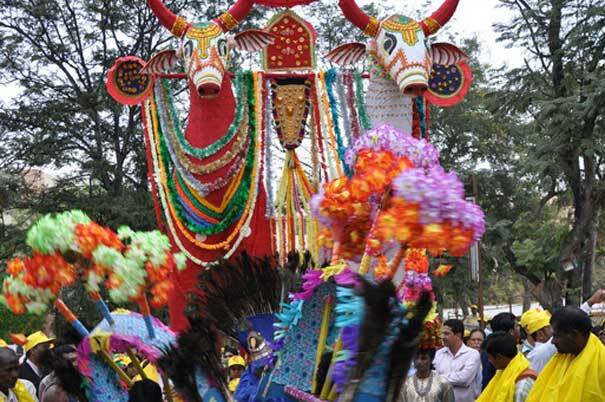 All these activities were conducted in the presence of the kith and kin of the boys and girls which was over five hundred in number. 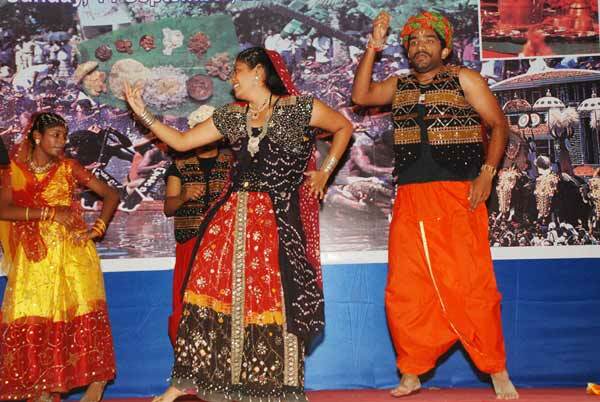 Various Malayalee community participates in the event from various towns and cities of Gujarat. 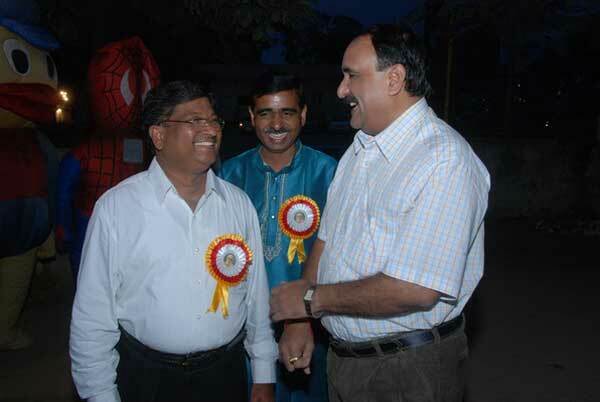 In order to strengthen the boding between the community members, SNCM, Ahmedabad organizes Annual Get-together of its members by bringing together all the members at a single platform to express their viewpoints. This is the perfect setting to renew the boding, exchange ideas and information. 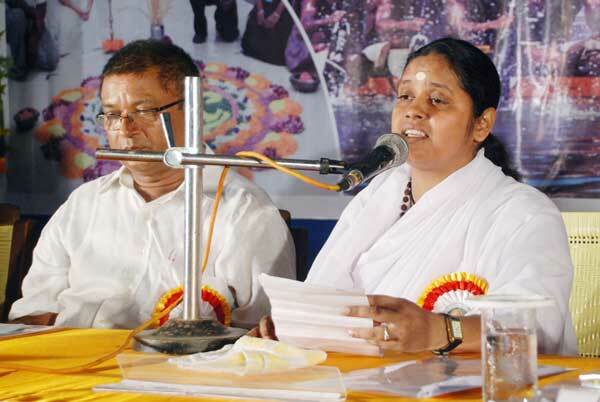 Varieties of programs are organized with the active participation from the members. Information and opinions are shared with each other.